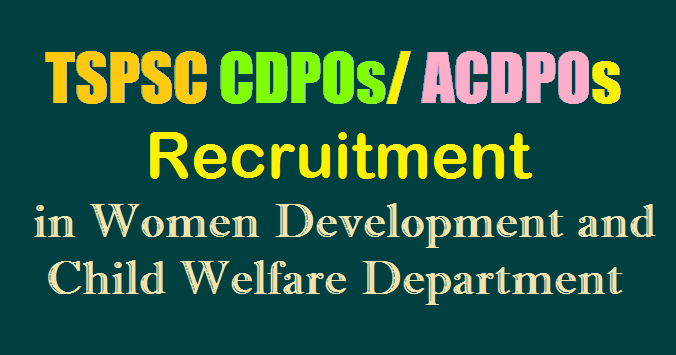 TPSPC said that it will conduct online examination on 4th January 2018 in the online system for recruitment of the Child Development Officer (CDPO) and Additional Child Development Project Officer (ACDPA) in Women's Child Welfare. Applications submitted by the applicants may be amended from 9th to 12th of this month if any mistakes made in BioData can be made. This will only give a chance and the candidates should carefully register the details. The application can be submitted between September 18 and October 16. The dates of the written examination (objective type) will be announced later and the hall tickets can be downloaded seven days before the exam begins. The examination will be either computer based recruitment test (CBRT) or offline OMR based. A candidate applying for the job should be of minimum 18 years and maximum 44 years as on July 1, 2017. There is an age relaxation for Scheduled Castes, Scheduled Tribes, Backward Class and some other categories of candidates. 1 Child Development Project Officer / Additional Child Development Project Officer in Women Development and Child Welfare Department Must possess a Degree in Home Science or Social Work or Sociology of any University in India established or incorporated by or under Central Act, Provincial Act or a State Act or an Institution recognized by the University Grants Commission. (Remittance of Fee) Each applicant must pay Rs. 200/- (RUPEES TWO HUNDRED ONLY) towards Online Application Processing Fee. This apart, the applicants have to pay RS. 120/- (RUPEES ONE HUNDRED AND TWENTY ONLY) ) towards Examination Fee. However, the following category of candidates are exempted from payment of Examination fee. N.B. : BC’s, SC’s and ST’s belonging to other states are not exempted from payment of Application processing Fee and Examination Fee and they are not entitled for any kind of reservation. i) Examination (Objective Type) by Online / OMR based. How to apply: Before applying for the posts, candidates shall register themselves as per the One Time Registration (OTR) through the Official Website of TSPSC. Those who have registered in OTR already, shall apply by login to their profile using their TSPSC ID and Date of Birth as provided in OTR. TPSSPC said that it will conduct online examination on 4th January 2018 in the online system for recruitment of the Child Development Officer (CDPO) and Additional Child Development Project Officer (ACDPA) in Women's Child Welfare. Applications submitted by the applicants may be amended from 9th to 12th of this month if any mistakes made in BioData can be made. This will only give a chance and the candidates should carefully register the details.